VAT4U offers you the possibility to directly export the expenses you entered to Excel. 4. 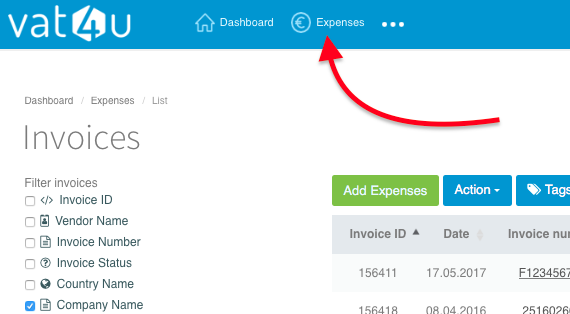 Setup the correct filters to select only the relevant expenses you want to export. 5. Click on Action / Excel Report. 6. You don't need to manually select lines. Export will work based on filters, e.g. if you filter one Company it will export all lines for that company (doesn't matter if you selected some lines or not). Note: the export discloses key information related to the invoices but not all data. If you have setup customised fields. they will also appear in your exported file.